A strange saga in the past few days has re-exposed rifts inBulgaria’s opposition socialist party – and exposed the fact that some of the country’s politicians find AIDS an appropriate topic for heavy-handed jokes. The saga started with Bulgarian Socialist Party MP Anton Koutev giving an interview in which, reportedly, he said that socialism was like AIDS. “Generally, it (socialism) is inherited or sexually transmitted. In our party, it is common for the offspring to become socialists simply because of their fathers,” Koutev said, in what was intended as a reference to his daughter who also has become an active member of the BSP. The first to take umbrage was Koutev’s fellow MP, Kornelia Ninova, who said that the comparison between AIDS and socialism was “outrageous and insulting”. Ninova called on Koutev to make a public apology and to resign, although her statement did not make it clear what sort of resignation she had in mind – from the party or from Parliament or both. Ninova said that, “if anyone has ever asked himself what socialism is, now he knows. According to a high-ranking member of the party’s leadership, it is a severe disease. Anyone who comes into contact with it is doomed.” She said that she could not accept Koutev’s statement or understand why he made it. It was insulting to socialists and would discourage the party’s youth, she said. Notably, Ninova is close to the currently vanquished Georgi Purvanov faction within the BSP, as is Roumen Petkov, who hit out at Koutev for making a laughing stock of the party. 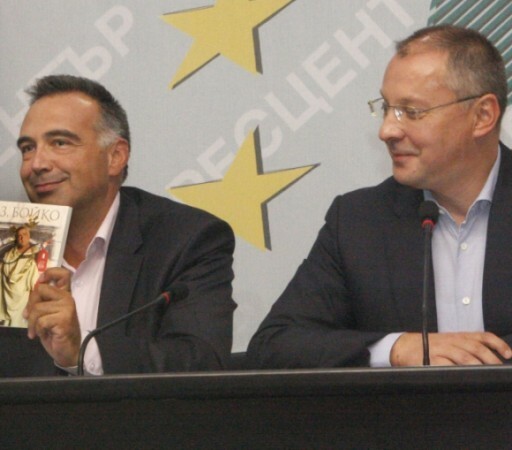 Speaking this past weekend, Petkov said that friends in the town of Sevlievo who were socialist party supporters “today teased us, they gave us condoms”. The BSP is the lineal successor to the Bulgarian Communist Party which held thrall over the country from after the end of World War 2 until the beginning of the transition to democracy in the 1990s. In government most recently as the majority partner in a tripartite coalition from 2005 to 2009, it has been consistently defeated by Boiko Borissov’s centre-right GERB party in the past few years’ parliamentary, municipal and presidential elections. The BSP is expected, going by current polls, to run second in the 2013 national parliamentary elections. Prime Minister Borissov, a day after the Koutev controversy began, could not resist a comment. On August 25, Borissov said that he had “ordered the executive committee of GERB and GERB deputy leader Tsvetan Tsvetanov to work out and distribute to all our structures in the country an instruction about AIDS/BSP prevention”. Borissov went on, as quoted by local news agency Focus, “It is very important to avoid any kind of contacts and take all necessary preventive measures so as not to get infected with AIDS/BSP. Especially after the now publicly known disclosures about the advanced stage of a disease and deformation in this party [BSP], despite its advanced age of 100 years,” Borissov said. BSP leader Stanishev responded to the controversy four days after it started, issuing a statement on August 27 through the socialists’ press office. Stanishev said that he had been observing for several days attempts by BSP functionaries and outsiders to add fuel to what Stanishev called “a rather contrived scandal”. But, Stanishev said, he did not understand BSP functionaries who wanted penalties to be handed down for retelling a joke. “There may be different opinions about the phrase used by Anton Koutev. It is worth recalling that for jokes, penalties were imposed, in another time, and I hope that the BSP has long forgotten such an approach,” Stanishev said, in an apparent reference to communist-era responses to humour that met official disapproval.